This spinach noodle soup is my secret weapon to staying healthy. When I'm not eating out, I make sure I eat damn well, and this soup is one of my default dishes. This soup is likely the first thing I make when I return from my travels. I make a huge honkin pot that will last me days, and this is how I 'detox' from my travels. I recently received an email from a reader asking for the recipe for this soup (after seeing this old post), so here it is. Good luck and I hope you enjoy this as much as I do. 1. Steam the chickpeas, kidney beans, and navy beans. To do this, boil 2 cups of salted water in a small pot. Turn off the heat, pour in the beans, and leave the lid on for at least 40 minutes. Drain excess water. 3. Add the steamed beans. Continue to simmer for 20 minutes. Add the dried lentils. Continue to simmer for 15 minutes. Add the noodles and simmer for an additional 15 minutes. Turn off the heat. Serve hot. If you feel your soup is not thick enough, sift some all purpose flour into the soup. If you don't want to spend the time to prepare the dried beans, you can always used canned beans which takes a lot less time. If that is the case, add the beans near the end of the recipe so that they don't overcook. 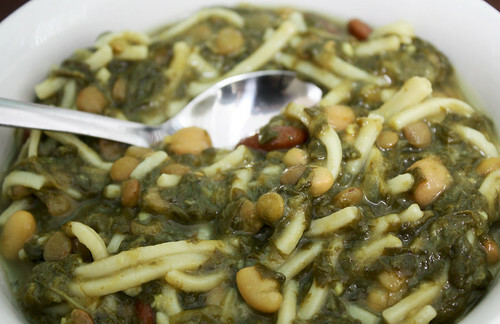 Persians like to add a hint of sourness to this soup. An option is to stir in a bit of plain yogurt or whey right before serving. That looks like a nice and healthy soup. I'll have to try it out, although looks like i'll have to drop by a persian grocer first to pick up some persian noodles. Thanks for the recipe. It is a super healthy soup. Good luck making it! Thanks for the comment. Impressed that you've tried this soup. It's one of my favorites! Curious if you've ever tried whey with this soup, and if so, what you thought. Hello, I love Ash-e Reshteh, I buy it at Balboa International Market in San Diego, CA. And I have to say that your picture looks exactly like my bowl of soup, checking the ingredients I think it is pretty much the same as theirs. As soon as I can make it I will post back and let you know how I did. this soup requires whey to make it authentic. 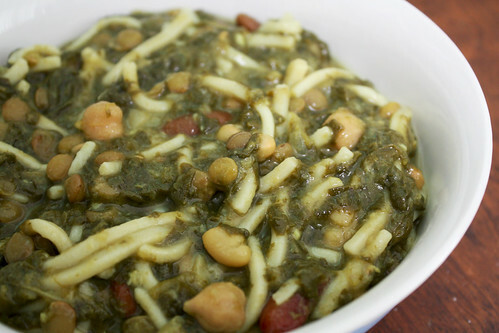 Also, in persian the soup is called soup of noodles so spinach is not the main ingredient. Neither are the noodles though. This isn't the most authentic recipe, btw. But still delicious, probably. Ive tried this soup in a birhday party for a little 3 year old boy, it was sooo yummy, I am from Peru and Peruvians like hot spicy food. 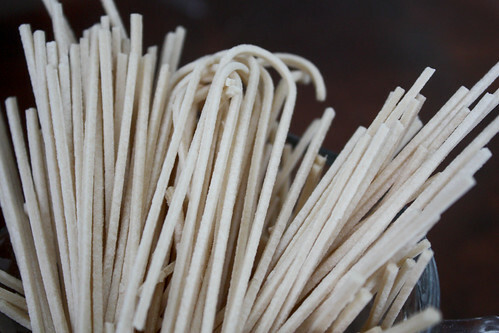 Thank you for that, it is delicious, although I used soba noodles, not having a Persian grocer nearby. In the past, I've made ash with fenugreek leaves and I was under the impression that they were an essential ingredient. Am I mistaken? Yumm. I love this soup...mum makes it once in a while. It's really hearty yet light. I think your recipe is very close to mums. Going to make some tonight!